Asked by White falcon on November 14th, 2015. We do not offer a kit for the silverface super reverb at this time. If you gather a list of cap values needed for your amp give us a call at 480-820-5411 and we can help you get everything you need. Don't forget the caps under that doghouse pan. You should need more than seven electrolytic caps!! I advise against swapping tone caps, but it's your amp. The Paktrons or Gudeman/Mallory brown caps are very good caps that last a very very long time. The 20uF and 70uF caps under that pan are the first caps to start leaking goo. Just to clarify, we will not be able to provide a list of caps used in a silverface as we do not have sufficient resources or reference materials. Asked by Anonymous on October 28th, 2015. This kit is not designed for the Super Twin Reverb but rather a "Super Reverb" which is a 4x10 amp in Fender's line. 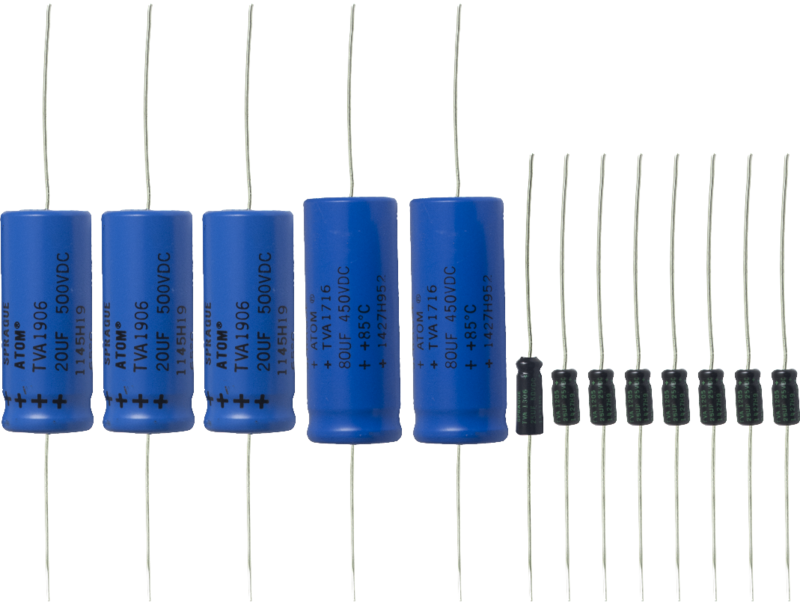 We do not offer a complete set for the Super Twin amp and caps would have to be ordered individually based on the values needed as it is a bit more obscure. The basic set will feature more of our standard axial electrolytics and the premium set will be largely made up of Sprague Atom caps. Asked by Anonymous on January 17th, 2016. There should be no problem going higher on the values but you never want to go lower. In this case you should be good to go. NO! NOT AT ALL There is an old adage with the old TV and radio repairmen. More capacitance or a higher voltage rating are always okay. Don't put a 220uF or 470uF or a 1000uF cap in place of a 70uF, but 80uF or 100uF or even 150uF are just fine. The tolerances on the old filter caps were usually +50% or even +100% and -5% to -20%, so less capacitance is bad, and the designers were not concerned with having more, only less. If the old one was rated for 450 volts, a 600 volt rating will also be just fine. If you read the tolerance of most filter caps, they will say -20% / +50% so a 70 uF cap could be anywhere between 56 uf and 105 uF and it is still within factory specs. We try to keep the -% lower than the +%. For this filter cap application, we are merely shunting the 60 and or 120 Hz and any harmonics thereof to ground, and out of the DC plate supplies for the amp. So the cap filters the DC out, and allows all the AC ripple to pass through to ground, where it is shorted back to ground. If we were trying to offset the AC to make a motor run smoother, then the tolerance would be closer to 4%, because the cap has become a precision timing device. That's a whole different ballgame, and one best left for fixing your air conditioner. 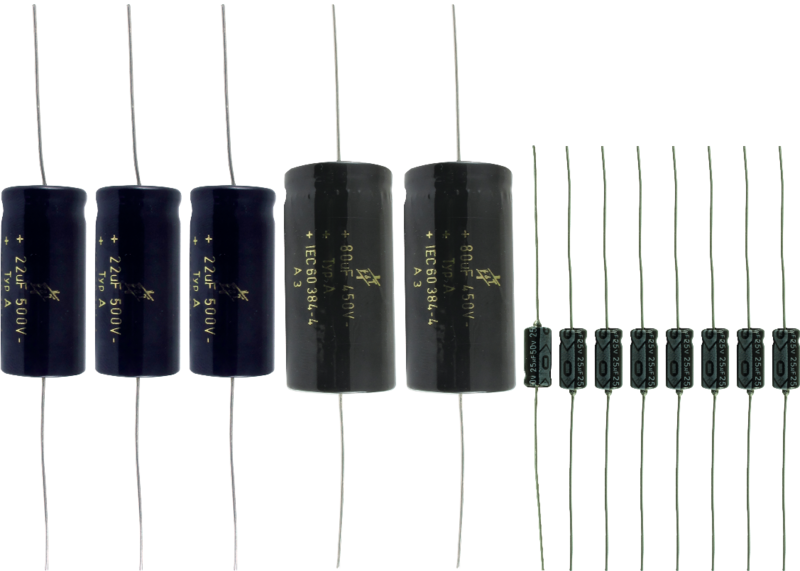 For simple filtering the more capacitance, higher voltage has always been an accepted rule of thumb, within reason. Too much capacitance and the rectifier tube can suffer a shorter lifespan, but you can go pretty high and still get away with it!! Some old P style caps had a tolerance of +100%/-20%. This means your 70 uF could be 140 uF and still be in spec. They designers were much more concerned about the capacitance being too low, rather than too high. Any difference you will hear between 70 and 80uF is because the old caps were worn out. There is nothing to worry about! This is a cap set for the blackface Super Reverb. Asked by Anonymous on January 24th, 2018. The premium caps set comes will all Sprague Atom caps.